Mexican Bean Beetle adult (left) and larva (right). Photo by R. Hammond. We have heard a few reports of either bean leaf beetles or grasshoppers increasing in soybeans. As we start to approach the end of the growing season the larger concern with these insects is the potential for pod feeding, rather than foliage feeding. Pod feeding directly impacts grain quality. Crop stage is also an important consideration. Late-planted fields or double-cropped soybeans which are still green when other fields are drying down can be “trap crops,” attracting both bean leaf beetles or grasshoppers leaving the other fields. Such fields bear close watching. 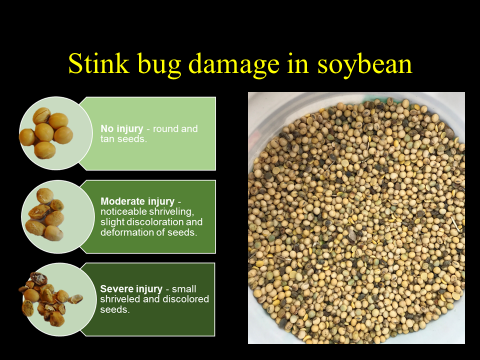 We have been hearing reports of Japanese beetles in corn and soybean. These beetles are large with a shiny copper and green color. Foliage feeding in corn is almost never economic, though economic damage from silk clipping is possible (though rare). Consider a rescue treatment when silks are clipped to less than ½ inch and, fewer than 50% of the plants have been pollinated, and the beetles are still numerous and feeding in the field.